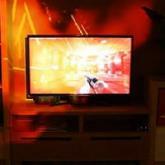 Illlumiroom uses a Kinect camera and a projector to extend graphics beyond the screen. But any hopes to see the project go mass-market have been dashed by a senior Microsoft executive. Albert Penello, head of product planning for Xbox One, said that it was too expensive to go mainstream. Speaking to the AusGamers website he said that the concept would remain as "just research" for the foreseeable future. "It's super-neat if you're in the lab and you've got Microsoft money..
"We looked at it, but for an average customers it's like thousands of dollars [to set up]." Using a Kinect camera and a projector, Illumiroom aimed to bring computer graphics to life around the whole living room. Microsoft showed off the project at this year's CES technology show, with developers saying that the system would "change the appearance of the room, and enable entirely new game experiences". At the time, experts questioned how practical the system was given that few people own a projector. Some speculated that the system could make it to the next-generation Xbox as some form of add-on, but since January's show, Microsoft has said little about the project. The idea of immersive video is something that others have experimented with, but few ideas have caught one. Philips launched Ambilight television sets in 2004 which projected light around the TV to suit the mood of the content being played. And since 2006 BBC research and development has been working on its own system, described as the visual equivalent of surround sound. It is using a reverse projection technique that works with standard projections and its own calibration software.